Kyle Wyman had an up-and-down weekend at New Jersey Motorsports Park. The KWR team brought home a quartet of top-10 finishes this past weekend at New Jersey Motorsports Park, in Millville, N.J.. Kyle Wyman scored 6th and 7th place finishes aboard his Cambr/Stonecastle/KWR Yamaha in Superbike while Bryce Prince finished up 8th and 10th on his RiderzLaw/KWR YZF-R6. ]The shortened Superbike race, which ran only 18 laps compared to Saturday’s 23-lap main, would close out the weekend as Wyman fought to the very end. His last lap of the race was 4 seconds faster than anyone else on track. Roger Hayden finished on the podium in race two at NJMP. New Jersey Motorsports Park was drenched under the remnants of Tropical Storm Gordon, yet in spite of soaking conditions Yoshimura Suzuki Factory Racing’s Roger Hayden and Toni Elias both earned rostrum finishes in Sunday’s MotoAmerica Superbike race two. Mathew Scholtz finished on the podium in Saturday’s Superbike race but crashed out on Sunday. Sunday was Mathew Scholtz’s 26th birthday, and he was excited to spend it at one his favorite places—in the saddle of his #11 Yamalube/Westby Racing Yamaha YZF-R1 Superbike. He started from the pole in the afternoon’s rain-shortened 18-lap feature event, with track conditions that usually favor Mathew’s smooth riding style. 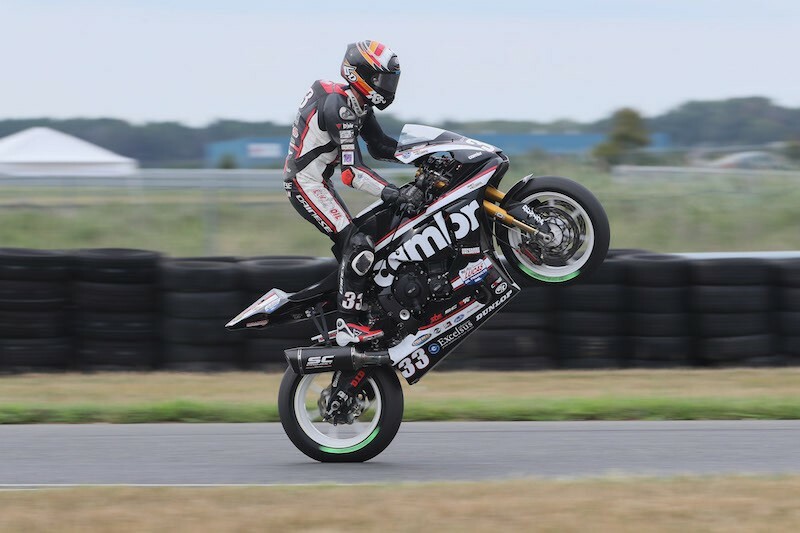 Cameron Beaubier wrapped up the 2018 MotoAmerica Superbike Championship on Sunday at NJMP. Monster Energy/Yamalube/Yamaha Factory Racing’s Cameron Beaubier became a three-time MotoAmerica Superbike Champion on Sunday after wrapping up the 2018 title with a confident victory amid a rainy, wet and slick Race 2 at New Jersey Motorsports Park. After clinching the 2018 MotoAmerica Supersport Championship on Saturday, JD Beach was ready for another win. Beach quickly maneuvered his Monster Energy/Yamaha Extended Service/Graves/Yamaha R6 into the second-place position at the start of Race 2, but the newly crowned Supersport Champion rode cautiously through the opening laps due to rainy and slick track conditions. On lap four, he capitalized on a mistake by race leader Hayden Gillim and moved to the front of the pack. From there, Beach maintained a solid pace in the unpredictable conditions to ride his R6 to victory for the eleventh time this season. In Supersport action, pole-sitter and Race 1 winner Hayden Gillim propelled his Rickdiculous Racing R6 into the lead from the start of Sunday’s Race 2. Gillim led the first three laps before going down, but the slick conditions allowed his bike to slide across the ground without major damage, enabling him to quickly remount and continue charging. Gillim then fought his way through the field to finish with an impressive second-place. YCRS/Motorcycle Mall’s Anthony Mazziotto III rounded out an all-Yamaha bLU cRU podium with a standout performance on his R6, earning his first Supersport podium of the season in his home state of New Jersey. Yamaha bLU cRU rider Tawfik Khalil prevailed through the tough conditions on Sunday to pilot his Khalil Racing International R1 to a season-first victory in the Stock 1000 class. Ohare Motorsports’ Ricky O’Hare also raced his R1 to a season-first podium, finishing with an impressive third in New Jersey. The Graves/Yamaha R3 Support Program riders proved to be on top of their game this weekend at New Jersey Motorsports Park. Following a podium sweep for the R3 in Saturday’s Junior Cup Race 1, MonkeyMoto/AGVSPORT’s Jay Newton was victorious while leading another Yamaha bLU cRU sweep in Sunday’s Race 2. Yamaha R3 riders claimed the top four positions in the class, with MP13 Racing’s Cory Ventura in second, Tuned Racing’s Joseph Blasius with his first podium appearance of the season in third, and Riderzlaw Racing’s Jackson Blackmon securing fourth-place in the toughest of conditions in New Jersey. The Yamaha bLU cRU riders will head to Birmingham, Alabama Sept. 21-23 for the final round of the 2018 MotoAmerica AMA/FIM North American Road Racing Championship series at Barber Motorsports Park. For complete schedule details, visit http://motoamerica.com/. KTM’s Alex Dumas won the Liqui Moly Junior Cup Championship on Sunday. 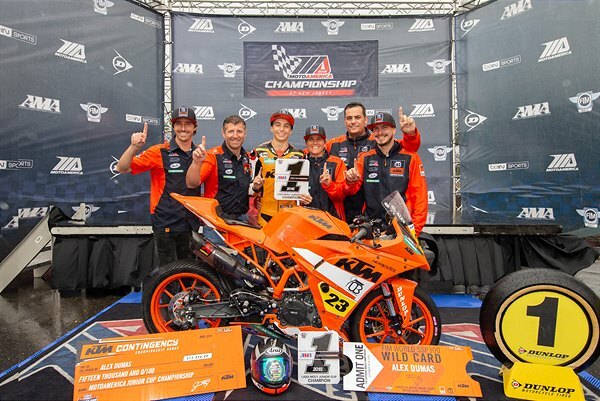 Alex Dumas and the KTM Orange Brigade Road Racing Team wrapped up the inaugural MotoAmerica Junior Cup Championship on Sunday in difficult conditions at New Jersey Motorsports Park. Dumas rode a conservative, championship-winning race on a rain-soaked track on the RC 390 R, equipped with the new SS300 Race Kit, to mark the first-ever U.S. National Road Racing Championship for the KTM brand and further extends this significant accomplishment from the young Canadian native.